Last Monday evening, I had the chance to attend the premiere of the French film, Samba, at the Cinema Gaumont in Saint-Etienne, France. 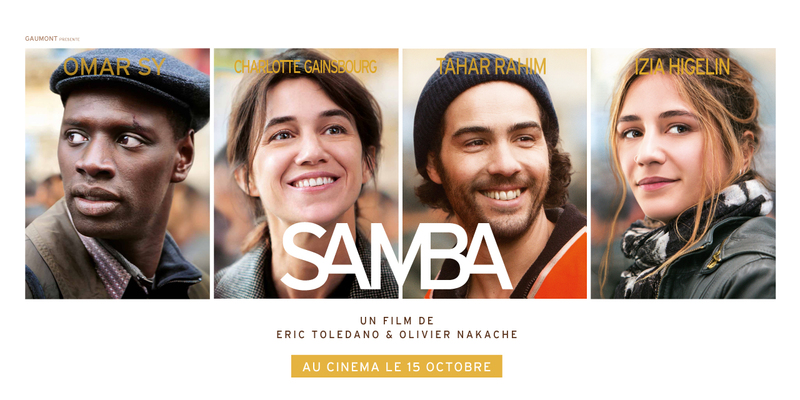 Samba is the new drama/comedy from the writer/directors of The Intouchables, Eric Toledano and Olivier Nakache (you can read Søren’s review of that movie here). The talented Omar Sy rejoins the filmmaking duo for their latest feature. Sy’s career has been on the upswing since he won a César award for best actor in 2012. He recently appeared in X-Men: Days of Future Past as Bishop, and is slated for a role in the upcoming Jurassic World in 2015. Getting to go to the premiere of Samba would have been exciting enough on its own, but I have to recognize that I went there interested in more than just the film. 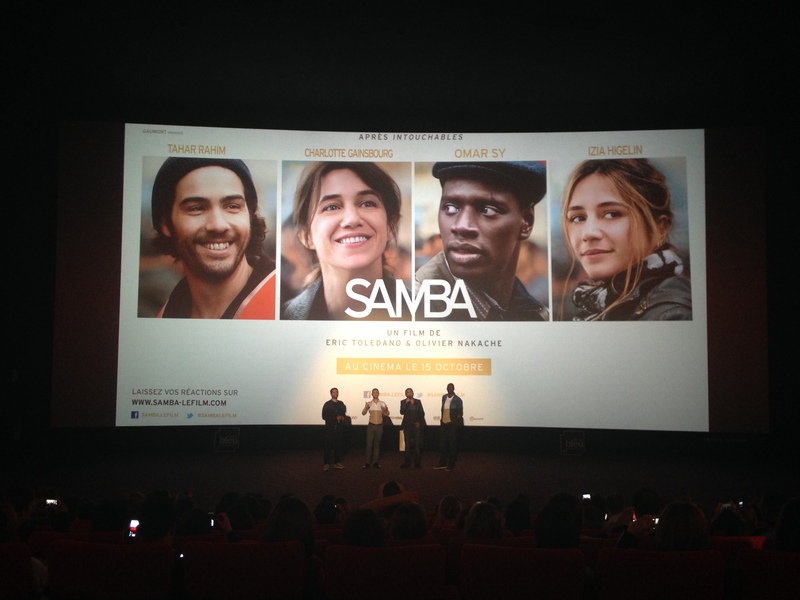 It turns out that both the writer/directors and Omar Sy himself were also there to present the movie to the premiere audience. The line begins to grow. I bought my tickets more than one week before the event. This was a good move; apparently, the session was completely sold out days in advance. This isn’t surprising given how famous Omar Sy has been in France ever since his standout part in The Intouchables. That film garnered, not coincidentally, the third highest attendance in the history of the French box office with more than 19.4M tickets sold. 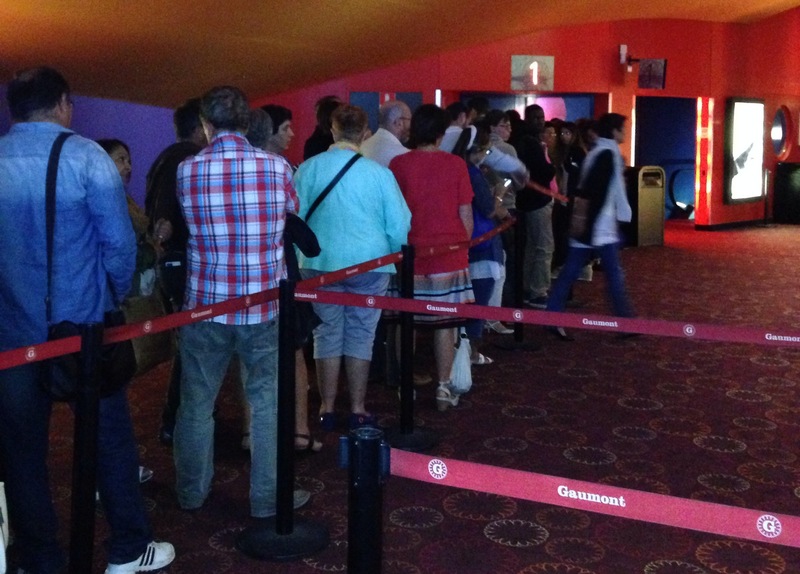 Around 1/3 of the French population went to the theaters just to see that movie. Naturally, Samba has been on the minds of French people for quite a while. You can understand why I arrived at the Gaumont (the distributor of the film owns a chain of cinemas, too) one hour before the event. Even with my head start, there were already around 100 people who’d arrived before me. We were in the largest room in the theater. It holds a total of 500 seats, and it was packed. From left to right: Olivier Nakache, Gaumont Host, Erik Toledano, and Omar Sy. When I arrived at the Gaumont, there was no sign of the Samba crew. We waited front of the room until the doors finally opened. And just on time, Eric Toledano, Olivier Nakache and Omar Sy arrived. For 15 minutes, they talked to us about how they made the film: from imagination to realization. The writer/directors couldn’t stop to thank Sy enough as they spoke about their relationship with the actor. This is the fourth time that Sy has worked in collaboration with these directors (their other films include Those Happy Days in 2006 and So Close in 2009). The filmmakers also mentioned the fact that to create the leading female role, they chose Charlotte Gainsbourg even before they’d starting writing the script. The character was conceived of and developer with the actress in mind. After this brief 15 minute introduction, it was time for the two hour-long movie to begin. Toledano, Nakache and Sy left the cinema as the film began in order to attend and present at another Samba premiere. As for the film itself, my full review can be found here. Thibault - pronounced "Teebo" - is Movie Fail's French connection. He writes film and television reviews from Lyon, the city where the Lumière brothers created the very first films over a century ago. He's also finishing architecture school this year.